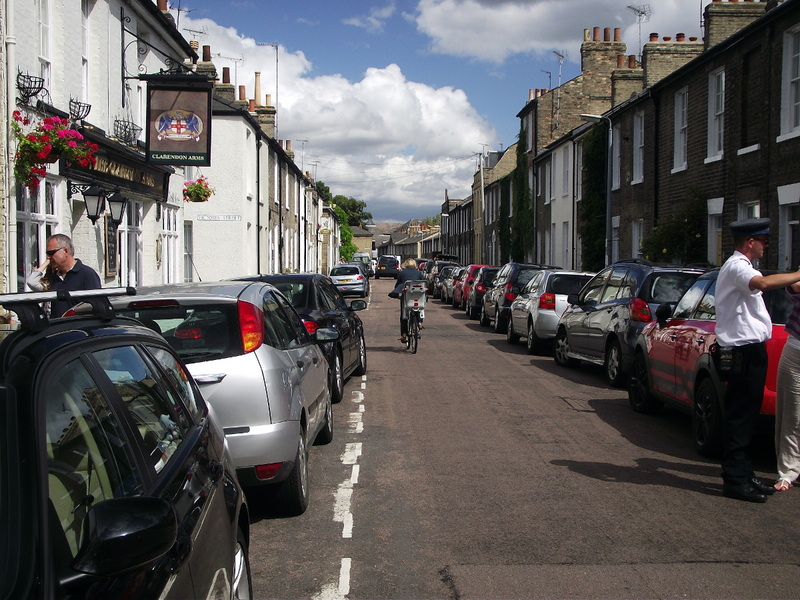 Most of the streets in Cambridge developed in the first half of the 20th century have no dedicated space for car parking, which causes all sorts of stresses and problem. But how are new developments allocating space on the street? I went on Cambridge Cycling Campaign’s new developments infrastructure safari with an eye on the current designs for the streetscape. Refer to the route map for the approximate positions below. This development is in its early stages with one terrace being built. The street has parking bays and on-street parking won’t be allowed. Parking will be enforced through private enforcement. The showhouse has a large garage with an off-street parking space in front of it. With one street occupied by owners we can see what the development is likely to look like. 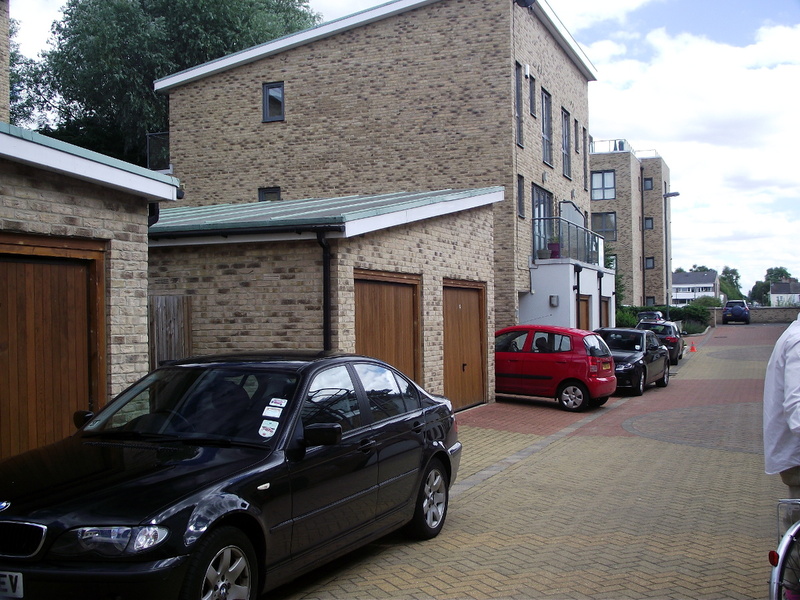 It appears that the garages that these houses have are either too small or inconvenient and instead cars are parked in the off-street spaces in front of the garages. When parked in the off-street spaces the cars are still visible and disrupt the design of the street. 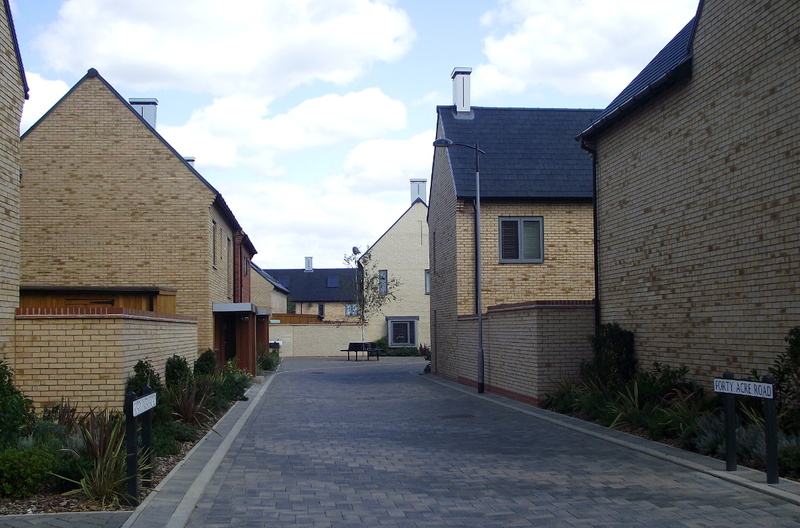 In the side streets of this development the space between the buildings is relatively narrow with no demarcation between road and footway, a shared space look. 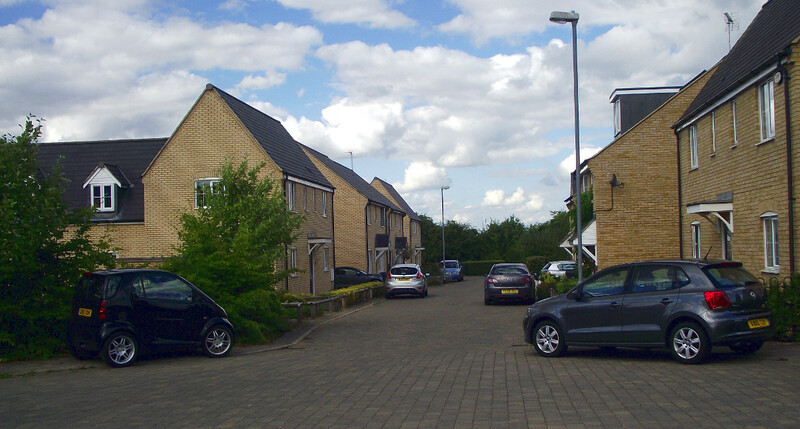 These houses are occupied and the off-street parking has been designed so that cars are not visible when looking down the street. There were no cars parked on the streets so I presume parking is only allowed in marked locations. The development, like most others, is free of yellow lines: park where allowed not anywhere that is not explicitly forbidden. 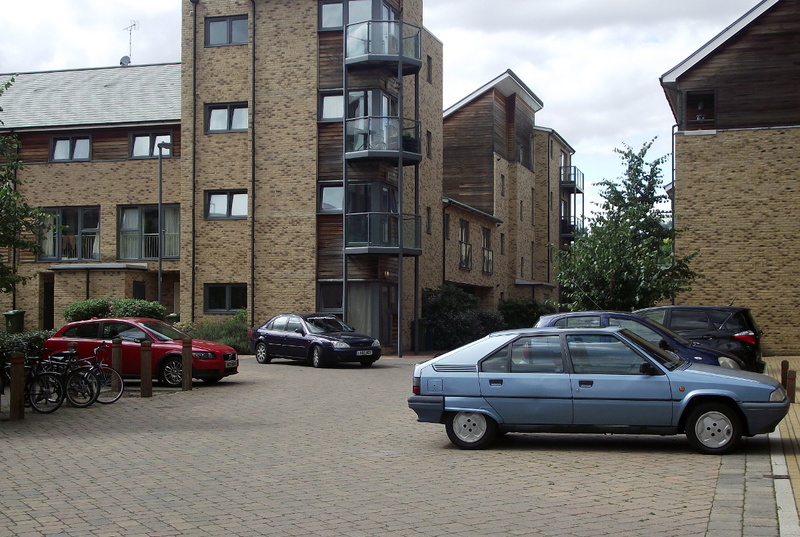 Despite having a large dedicated car park at the rear, parking is also allowed in the courtyard at Winstanley Court. On the right an area is dedicated to disabled parking while that on the left is general parking. The parking on the left probably prevents ball games in the large green area to the left although this development probably doesn’t have many children resident. The streets at Vie are classified as a Home zone, although how many people know what this means? The aim seems to be to encourage play and ‘social interaction’ rather than streets being used just for the movement of cars [sic]. The cars in the square (first picture) are parked ‘anti socially’, it’s not ‘illegal’ but it is against the lease conditions. 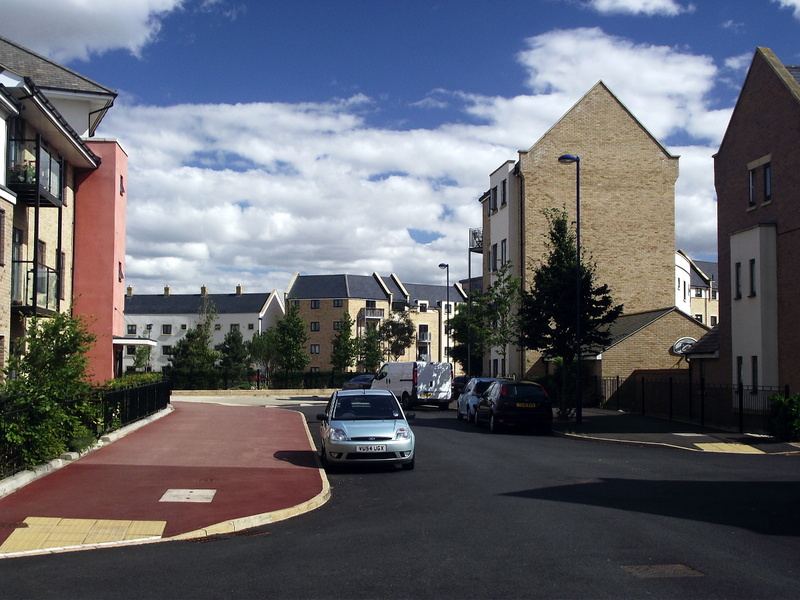 The cycle stands were added after the development was built and are well used despite the skepticism of some residents. 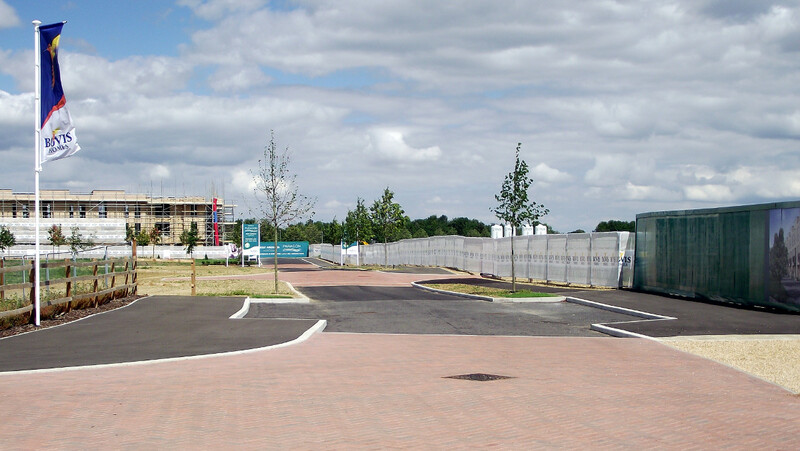 There is ‘cycle storage’ (compare to cycle parking and car parking) at the development but either there is not enough or people find these stands more convenient. On another street there is plenty of informal on-street parking despite allocated parking areas and garages. This seems to be caused by those with second cars and the size and location of garages that makes parking in garages inconvenient. The gray strip separates ownership of the land and parking enforcement isn’t carried out on one side, as shown in the second picture. Overall it seems that Vie has failed to adequately provide for and manage car and cycle parking with the consequence that cars are left on the street in ‘anti social’ locations. 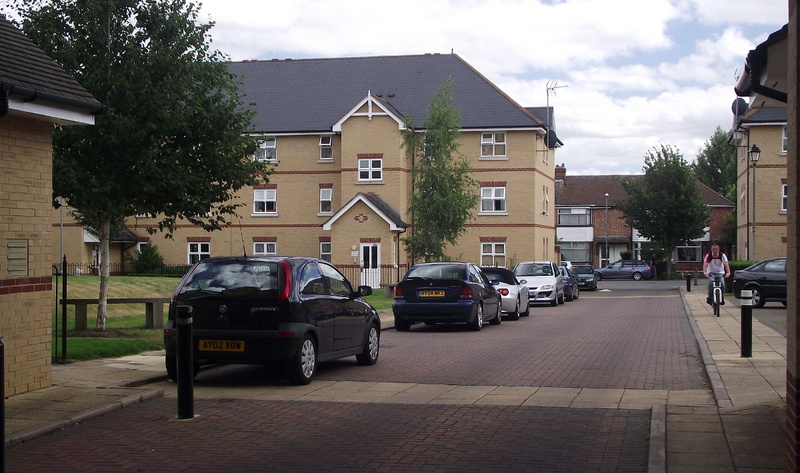 Orchard Park has a mix of streets with the traditional layout of tarmac roads and segregated footways and shared space style streets. 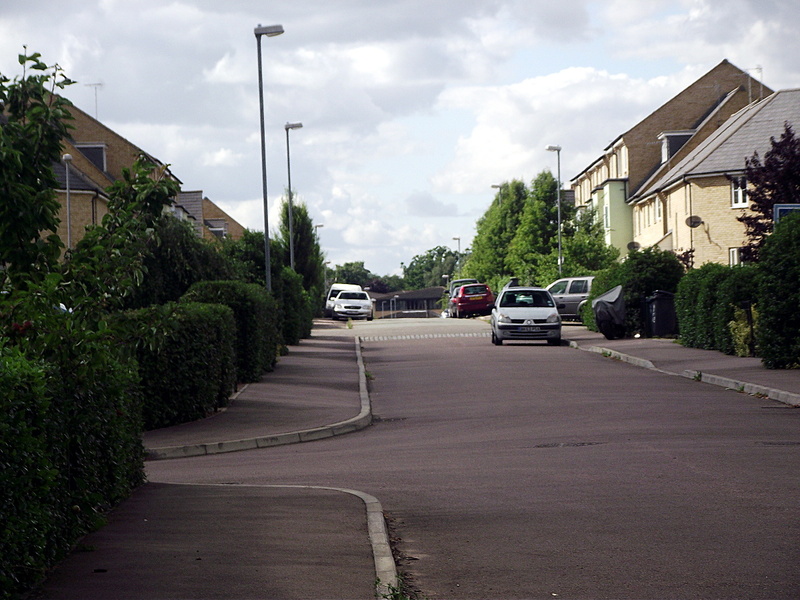 In the first picture the footway is unusually wide because it is the shared use spine between the community centre and the school. Despite all the available space there is no segregated cycle track and, as you can see in the picture, no priority over even minor side roads. There seem to be no controls on parking here. The Quills features a mix of traditional street layouts and block paved areas. There appear to be no parking controls here, probably none are needed, but sadly anti social parking has taken hold with a number of vehicles on the footway. In some areas cars seem scattered about. This is despite houses having garages and off-road parking. David Hembrow blogged about this development some time ago and compared it to the Netherlands. 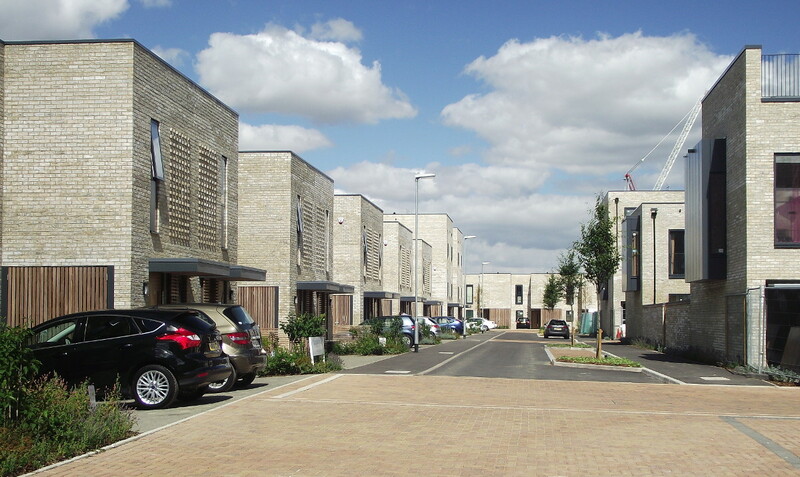 The example of Trumpington Meadows shows that you can design a modern street with parking where vehicles aren’t dominant, but it requires parking enforcement otherwise it becomes a free for all like Vie or The Quills. Nonetheless these streets are in a better state that Clarendon Street (in the city centre) where cars are parked on both sides of the street, narrowing it to one lane. 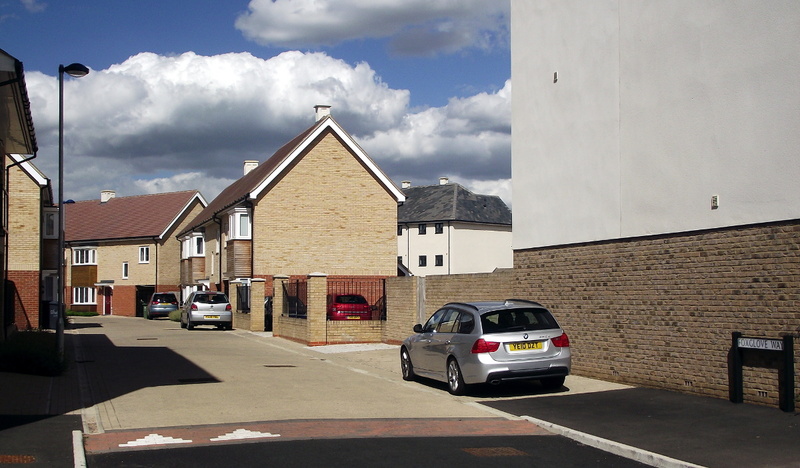 People walking are confined to narrow pavements as cars cruise for free parking. Ironically a local councillor is pleased that Blue Badge holders do not park in nearby New Square, a conservation area, as it would spoil the look and yet he supports on-street parking in adjacent streets. 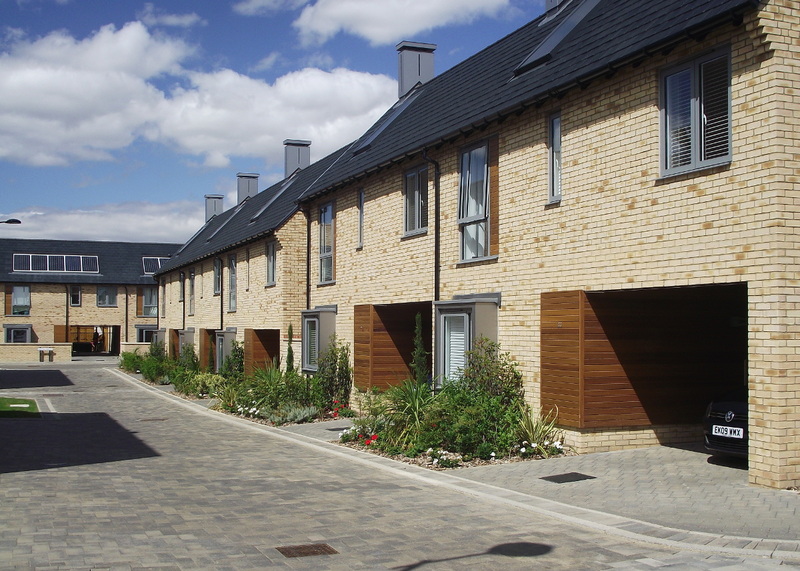 Clearly the shared space look is popular and gives developments some freedom to create a different look from that of the standard suburban estate of the 20th century with a standard street layout. But are they embracing the ideas of streets for people or simply saving valuable land? 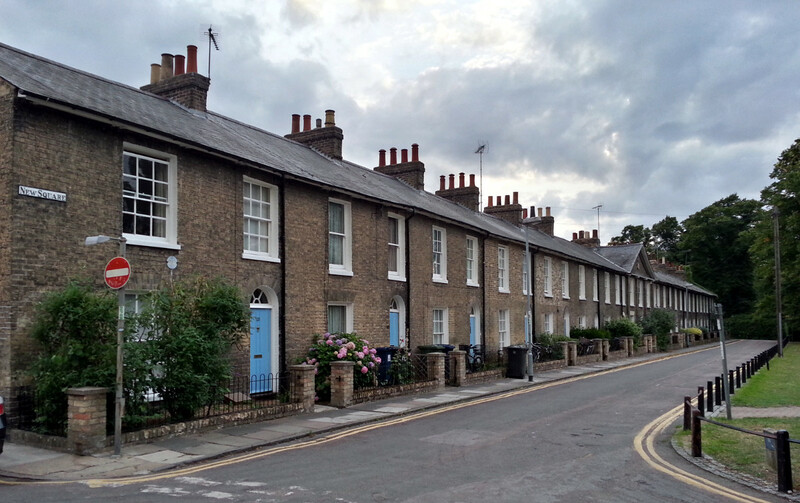 This entry was posted in Parking, Planning, Roads and tagged Cambridge, Streetscape by rich257. Bookmark the permalink. Looking at new developments in Cambridge, reduced to “bedrooms and parking” makes me sad.